When Volkswagen first took the plunge of marketing its commercial Transporter vehicle to the leisure sector, little did anyone comprehend the icon it would eventually become. Camping is fantastic in itself but VW camping is something else. The VW camper van virtually owned the leisure market from the Fifties through the Seventies to the early Eighties and is still going strong today. It’s rear-mounted Porsche designed air-cooled engine has been in production for around 70 years and has won many awards. For many of us, the prohibitive costs of a VW camper (£15,000 plus!) will mean that owning one will forever be a pipe dream, but the chance to get behind the wheel of one should definitely be on your list of things to do before you die. If you love that Sixties retro look, but have always felt nervous about trusting a VW camper van, then let us put your fears to bed. VW campers today have all the style of their predecessors with the improved reliability, safety and comfort of a state-of-the-art campervan. For the ecologically minded, some even run wholly or partly on bio fuel, minimising your environmental footprint. Experience a holiday of nostalgia and freedom with one of the many VW camper hire companies available to choose from. But which should you go with? Weight or passenger number restrictions will apply, and each company is different, but you should be able to comfortably carry and accommodate four passengers, although you may need to purchase an extra awning. Extra storage space will often be available in the form of a roof rack, although you will need to check about prices. 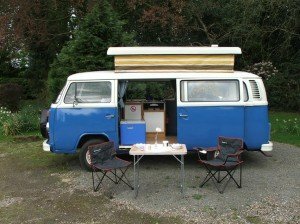 Most VW camper vans will come equipped with a cooker and fridge, seats that convert into beds and extra beds in the roof space. To round off the perfect holiday, many VW camper rental companies provide tempting extras like bicycle racks (and even bicycles to go with them). Take time to browse the individual suppliers to find a solution that fits your lifestyle needs. If you are a technophile, there are plenty of companies who will throw in DVD players and digital TVs, and don’t be surprised if there’s a socket for your iPad. It may not exactly resonate with the ‘hippie’ vibe of VW camping, but it will certainly keep the kids amused on long journeys. If you are more a Cluedo or Scrabble family, many companies will pile your vehicle with games, books and puzzles to while away the rainy days. 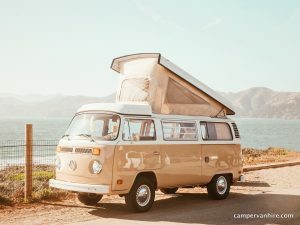 For those who like to travel in luxury, some VW camper rental companies include designer throws, plush curtains, and quality bedding and cushions, with powerful sun shades to help keep the temperature comfortably cool. To maximise convenience and cut down on packing, some will stock you up with crockery, cutlery and even a food hamper for your journey. 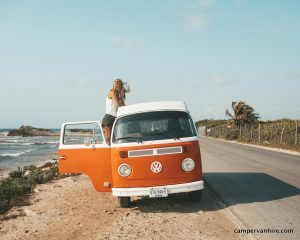 As you can see, there is more than one way to experience a VW camper holiday, with the specific needs and preferences of your family determining which of the many companies you hand your hard-earned cash too. Our advice is to take your time comparing options; that way, you stand the best chance of enjoying the perfect holiday.